When Pano Logic went out of business in 2012, their line of unique FPGA-based thin clients suddenly became a burden that IT departments didn’t want anything to do with. New and used units flooded the second-hand market, and for a while you could pick these interesting gadgets up for not much more than the cost of shipping. Thanks to considerable interest from the hacking community the prices for these boxes have climbed a bit on eBay, but they’re still a great way to get your feet wet with FPGA hacking. Especially now, as Pano Logic fanatic [Skip Hansen] has figured out how to flash a new firmware on them without having to crack open the case and break out the JTAG or SPI programmer. For the seasoned hardware hacker that might not seem like a big deal, but if you’re new to the game or just more interested in the software side of the equation, this trick makes things considerably more accessible. Having an external programmer is still a good idea if things go south, but if you’re just looking to flash some demos and see what the hardware is capable of this is a huge quality of life improvement. Even if you aren’t interested in fiddling with the orphaned products of a defunct Bay Area startup, the write-up is a fascinating look at practical software reverse engineering. As it turns out, [Skip] didn’t create this new firmware update tool from scratch. 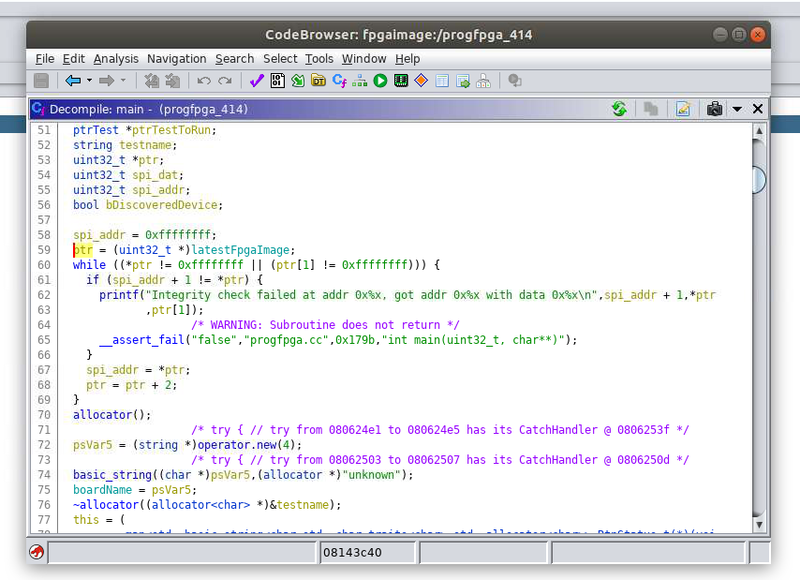 He actually opened up the official Linux update utility from Pano Logic in Ghidra and was able to figure out where the firmware image actually lived inside the program. He then wrote his own tool in C which will patch the update tool with a user-supplied firmware image. After patching, all you need to do is follow the official update procedure, which Pano Logic helpfully documented in the YouTube video after the break. [Skip] mentions he didn’t find any clear license information in the official software he was fiddling with, and of course with the company out of business it’s not too likely anyone is going to come knocking down his door anyway. Still, he says the downloads for the Pano Logic updater are still floating around on the tubes out there for you to find, so he’s not distributing anyone’s code but his own in this project. There are a number of hackers out there working to turn the Pano Logic thin clients into useful general purpose FPGA platforms, such as [Tom Verbeure], who’s incredible graphics demos got [Skip] inspired to grab his own unit off eBay. With support for USB and SDRAM added by [Wenting Zhang] while getting his FPGA GBA emulator running on the hardware, it seems there’s never been a better time to get on the Pano Logic train. While trying to revive a Donkey Kong Jr arcade board, [Jelmer Bruijn] found himself in the market for an EPROM programmer and became the proud owner of a 1990’s era Dataman S4. Despite its age, it’s a fairly nice tool which allows you to read and write a laundry list of different EPROM types, all without being tied to a computer. The only catch is that a few types of chips need an adapter to work in the Dataman S4, some of which are unsurprisingly no longer available. After some above and beyond support from the current crew at Dataman set him on the right track, [Jelmer] decided to try his hand at reverse engineering how the old adapters worked so he could build his own. 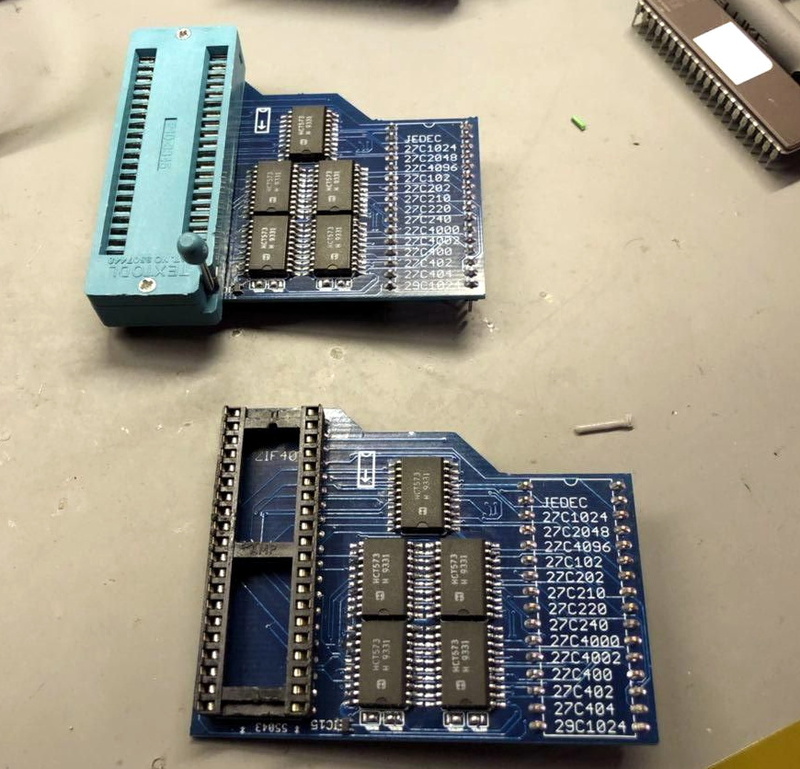 His ultimate goal was to read 40 pin EPROMs on the 32 pin Dataman S4, but in the end he says the information he gathered should be applicable for building other adapters if you ever find yourself in need of such things. As you might expect, there’s a bit more to the project than a simple pin adapter. [Jelmer] assumed some kind of shift register or latching arrangement would be required to make up for the shortage of pins on the Dataman S4’s ZIF socket. It was just a matter of figuring out how it all went together. Luckily, [Jelmer] found that the programmer would happily attempt to perform operations on a 16 bit EPROM even though no adapter was physically present. This gave him a chance to probe around with a logic analyzer to figure out what it was trying to accomplish. The trick turned out to be splitting the 16 bit bus into two 8 bit buses which are requested sequentially. With careful observation, close studying of 16 bit chip datasheets, and much brow furrowing, he was eventually able to come up a design that used five 74xx573 latches and put a schematic together in Eagle. There were a few kinks to iron out when the boards finally arrived, but ultimately the design worked on the first try. [Jelmer] says the same technique should work for 42 pin EPROMs, but as Dataman still actually sell adapters for those he decided not to supply schematics for it. [Jelmer] tells us that he was inspired to send this success story our way after reading how our very own [Elliot Williams] took the long away around to erase a couple UV EPROMs recently While this isn’t the first time we’ve seen somebody have to hack support for 16 bit EPROMs into their programmer, it’s good to see that the manufacturer at least had the customer’s back in this case. If there was one downside to 8-bit computers like the Commodore 64, it’s that they weren’t exactly portable. Even ignoring their physical size, the power requirements would likely have required a prohibitively large power bank of some sort to lug around as well. The problem of portability has been solved since the late ’70s, but if you still want that 8-bit goodness in a more modern package you’ll have to look at something like retrocomputing madman [Jack Eisenmann]’s DUO Travel computer. The computer is based around the ubiquitous ATmega328 which should make the ease at which it is programmable apparent. Even so, its 14-button keypad makes it programmable even without another computer. While it has slightly less memory than a standard C-64, it’s still enough for most tasks. And, since its powered by a 9-volt battery it doesn’t require any external power sources either. The most impressive part of the build, however, is the custom programming language specifically tailored for this platform. After all, a 14-button keypad wouldn’t be a great choice if you had to program in Perl or C all the time. There is some example code on the project page for anyone interested in this specific implementation. While it’s not the most minimal computer [Jack] has ever built, it’s certain to be much more practical. Turning an Arduino of virtually any sort into a simple AVR 6-pin ISP programmer is old hat. But when Atmel came out with a series of really tiny AVR chips, the ATtiny10 and friends with only six pins total, they needed a new programming standard. Enter TPI (tiny programming interface), and exit all of your previously useful DIY AVR programmers. [Kimio Kosaka] wrote a dual-purpose TPI and ISP firmware for the ATmegaxxUn chips that are used as a USB-serial bridge on the Unos, and constitute the only chip on board a Leonardo or Micro. The catch? 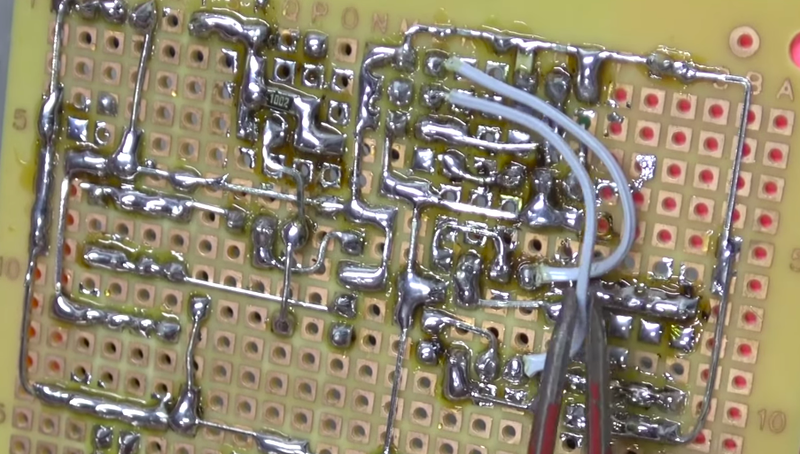 You’re going to have to do a little bit of fine-pitch soldering. Specifically, [Kosaka-san] wants you to get access to an otherwise obscured signal by drilling out a via. We’d do it just for that alone. I got into AVR chips because they are easy to program, and that has become more and more true over the years with the ever-falling cost of programmers. But it’s pretty easy to make a mistake when burning the fuses on the chips and if you don’t have a proper programmer (my first programmer was a horrifyingly slow self-built DAPA cable) you’ll have a brick on your hands. This little board may be able to help in that situation. I gave the USB µISP a try this week. The half-stick-of-gum-sized board flashes firmware like a champ and includes a rescue pin for when you have clock source problems. My full review is below. All technical information for the µISP can be found in the User’s guide. The board itself is now available to purchase in the Hackaday Store.